Now we’re back to my Hong Kong series! Knowing that our itinerary for the third day is packed, you’d think we’d wake up early. Nope, it didn’t happen. We were up by 6:00 AM and after singing a quick ‘Happy Birthday’ song to Sydney with our morning voices, we dozed off again. I think it’s because we got our fill of Ocean Park in half a day that we thought it’ll only take that long to roam Disneyland – which is also included on our third day itinerary. Add that to the fact that we were tired and our feet were cursing us out, we overslept. First wrong decision of the day. Obviously very lost and has to google every landmark we see. Second wrong decision of the day was trusting Google Maps. According to Google and Google Maps, it should only take about nine minutes of walking from MTR Central station to reach our first destination of the day, Hong Kong Zoologinal and Botanical Garden. Guess how long it took us? About an hour. The only pros of this getting lost bit is 1. I can now check [get lost in a foreign place] from my bucketlist, 2. We got our daily cardio exercise and 3. We got a glimpse of the high class living in Hong Kong. We ended up in buildings boasting of Louis Vuitton and Hermes among others before walking in a mostly deserted streets that houses an elementary school and a chapel. We finally got directions from a fellow Pinay when we were so closed to just going back to the MTR station. Thanks ate! Hong Kong Zoological and Botanical Garden is the Central Park of Asia. Getting lost was worth it. If we had hours to spare, it would be lovely to just take a stroll in the place and sit down in the benches. And they have tulips that were very lovely and lively! The garden was said to be the first garden in Hong Kong and probably one of the biggest, too. It’s categorized into two sections: the east garden and the west garden. We were only able to roam the east garden – specifically the Fountain Terrace Garden. A bronze statue of the deceased British King George VI, the Children’s Playground, Bird House, Jaguar Cage, and Plant Greenhouse are also seen in the east garden. The west garden is mainly the home of mammals and reptiles – including a flamingo, a lemur, and turtles! Zoological and Botanical Gardens is open from 5:00 AM to 10:00 PM daily. Café de Coral is where we had our lunch and dinner for the day. It’s sort of like a fast food chain but food options are different from every branch. We saw a branch in Central and another near Ladies’ Market. All the dishes we had from this fast food were so good and worth the money. 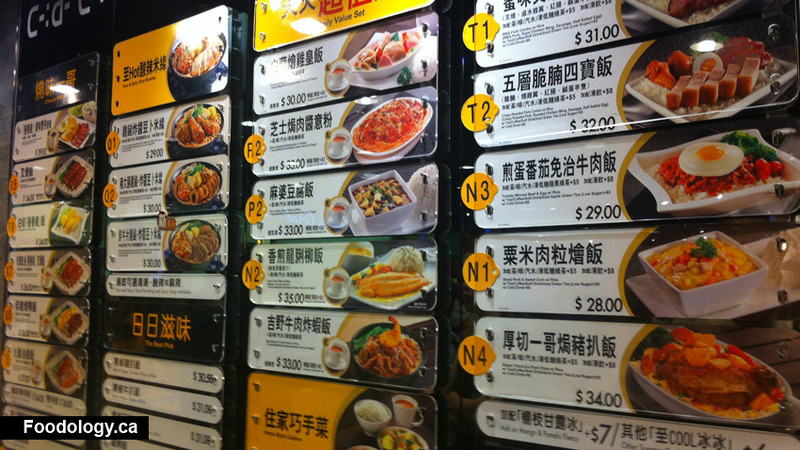 They’re also really affordable – you can get rice meals for HKD33 inclusive of drinks. I loved their fried chicken with cream sauce meal! N4 was so good, I swear! Café de Coral is open from 10:00 AM – 9:00 PM. For a night market, they sure close early. We arrived around 10PM but a lot of stalls were already closing! We weren’t able to take photos at all as we rush to shop. Shirts are going at a rate of 8 shirts for HKD100 (PHP670). Character USBs (64G) goes for 6 for HKD100. Sets of magnets and keychains go for HKD50 (PHP335). It was fun to shop in Hong Kong; the haggling part is really entertaining! Some even just agree to whatever price we ask for! Haha! I didn’t want to overspend too much, but I was really eyeing some bags, gloves, and boots! Good thing I was and still am on a shopping ban or else bye bye savings. We finished shopping in 30 minutes and spent another 30 minutes just roaming the streets and trying to soak in as much of Hong Kong on our last night.